Questions linger: Why did shooter target dorm? Jump to video Is there a connection? 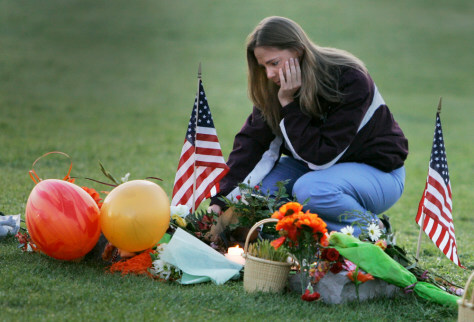 Next story in Massacre at Virginia Tech Fact file: Deadliest shootings in U.S.
Virginia Tech alumnus Michelle Creamer, 25, of Bracey, Va., visits the makeshift memorial in front of Burruss Hall on the campus of Virginia Tech University in Blacksburg, Va., on Saturday.